What is it going to take for us to do something? 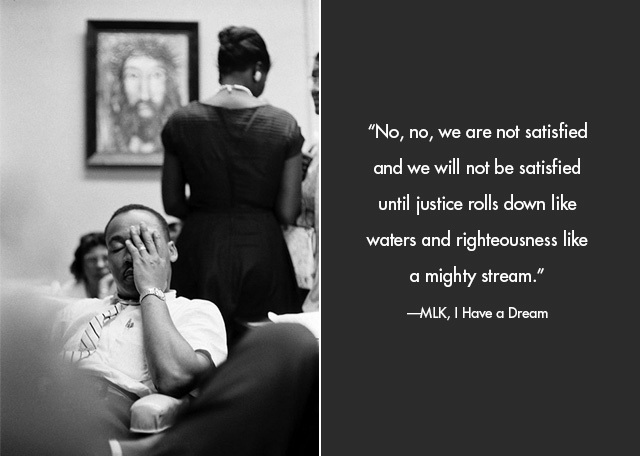 You can read the full I Have A Dream speech here. It’s not very long. Worth the read, obviously. This was our country just 50 years ago. But 50 years from now I have no doubt that our children will be flabbergasted by the racism, sexism and homophobia that exists today. Low-income children don’t have access to good education, books or even food. In fact, 61% (of low-income families) have no books for their children. Racial slurs are swept under the rug. Women are objectified all over the media and are still severely underpaid in the workplace. 1.2 million children are trafficked every year. The global annual profits made from trafficked forced labor is $31.6 billion. That’s just a start. What is it going to take for us to do something? It is the responsibility of those with the power, resources and education to stand up for the defenseless. There is a responsibility in having plenty.